For the price, the Optima’s outstanding array of standard features can’t be beat. Power windows and locks, heated side-view mirrors and a six-speaker sound system are just a few of the niceties this low-cost car offers. Armed with a five-star crash rating and Kia’s 10-year, 100,000-mile warranty, this mid-size is an all-out contender. Engine and Drivetrain: 2.4-liter inline four-cylinder engine, 162 horsepower, 164 lb-ft of torque; 2.7-liter V-6 engine, 185 horsepower, 182 lb-ft of torque; 5-speed manual, 5-speed automatic transmission; front-wheel drive. Hyundai’s entry into the mid-size market also carries an unexpected number of creature comforts, even in base trim. It’s clear that the Sonata has its sights set on more mainstream cruisers like the Camry and Accord, as the car comes standard with cruise control, keyless entry, an impressive stereo and three months of XM satellite radio. 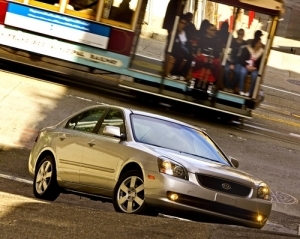 With all of those features for just a shade over $18,000, the Sonata is a smart buy. Engine and Drivetrain: 2.4-liter inline four-cylinder engine, 175 horsepower, 168 lb-ft of torque; 3.3-liter V-6 engine, 249 horsepower, 229 lb-ft of torque; 5-speed automatic, 5-speed manual transmission; front-wheel drive. The real beauty of Ford’s Fusion is its available all-wheel drive system. Putting power to all four wheels will drain fuel economy, but it will also help make sure you and your family get where you’re going safely, even in the worst of weather. Though only available in SE and SEL trim, the system bumps the Fusions price tag up to a still manageable $21,810. Engine and Drivetrain: 2.3-liter inline four-cylinder engine, 160 horsepower, 156 lb-ft of torque; 3.0-liter V-6 engine, 221 horsepower, 205 lb-ft of toque; 5-speed manual, 5-speed automatic, 6-speed automatic transmission; front-wheel drive with optional full-time all-wheel drive. The benchmark to which all other automakers strive, the Camry is the best-selling car in America. With a clean design, legendary reliability and a good smattering of standard features packed into a low entry price, there’s little wondering why. The Camry comes with power windows and locks, keyless entry and a kicking stereo, all standard. There’s even a hybrid version for the eco-minded. Engine and Drivetrain: 2.4-liter inline four-cylinder engine, 158 horsepower, 161 lb-ft of torque; 3.5-liter V-6 engine, 268 horsepower, 248 lb-ft of torque; 2.4-liter inline four-cylinder hybrid engine, 147 horsepower, 138 lb-ft of torque; 5-speed manual, 5-speed automatic, 6-speed automatic transmission; front-wheel drive. The Fusion’s corporate cousin, the Milan sports an extra level of refinement in base trim. A premium sound system with audio input and MP3 capability is standard, as is a fold-flat passenger seat that allows you to haul longer objects. Outside, the slick LED tail lights and tinted glass make the Milan look a little classier than its Ford brethren. Though the G6 loses some of its snappy looks and power in base trim, it manages to retain most of its more robust sibling’s allure. The dash still wears the same cool analog gauges inside, and as with all General Motors vehicles, OnStar ensures you never lock yourself out. Of course, for a little extra change you can opt for any of the sportier performance packages to make the drive a little more entertaining. Engine and Drivetrain: 2.4-liter inline four-cylinder engine, 164 horsepower, 156 lb-ft of torque; 3.5-liter V-6 engine, 219 horsepower, 219 lb-ft of torque; 3.6-liter V-6 engine, 252 horsepower, 251 lb-ft of torque; 4-speed automatic, 6-speed automatic transmission, front-wheel drive. With bold styling that stands out from the crowd, the Dodge Avenger’s body borrows heavily from the iconic Charger. Powered by a stout 2.4-liter four-cylinder engine, the car’s 173 horsepower is enough to back up the aggressive exterior. Though a more powerful 3.5-liter V-6 and all-wheel drive are optional, the base model’s 21 mpg city and 30 mpg highway is well worth sacrificing for. Engine and Drivetrain: 2.4-liter inline four-cylinder engine, 173 horsepower, 166 lb-ft of torque; 2.6-liter V-6 engine, 200 horsepower, 190 lb-ft of torque; 3.4-liter V-6 engine, 235 horsepower; 4-speed automatic transmission, 6-speed automatic transmission; front-wheel drive with optional full-time all-wheel drive. Mazda proudly labels its mid-size a ‘sports-sedan,’ though its base 156 horsepower 2.3-liter four-cylinder engine leaves something to be desired in the power department. Still, great standard equipment like keyless entry and audio controls mounted on the steering wheel make the 6 well worth its $19,790 price. Mazda’s mid-size lives up to its sporty moniker when you opt for the optional 3.0-liter V-6, but expect to pay extra for the 212 pony version. Engine and Drivetrain: 2.3-liter inline four-cylinder engine, 156 horsepower, 154 lb-ft of torque; 3.0-liter V-6 engine, 212 horsepower, 197 lb-ft of torque; 5-speed manual, 5-speed automatic, 6-speed automatic transmission; front-wheel drive. Another well-styled domestic mid-size, the Sebring borrows design elements from its Crossfire kin. Though the Sebring shares blood with Dodge’s Avenger, the Chrysler comes standard with a few features absent from its aggressive brother. The Sebring comes with a one year subscription to SIRIUS satellite radio, which is sure to please audiophiles out there. The Malibu has evolved out of its former play-dough design into an incredibly striking sedan. A proud nose blends seamlessly into sculpted sides, and the exterior displays more improvements on what had been a blah-mobile. Cruise control, XM satellite radio and OnStar come standard, as does a gas-friendly 2.4-liter four-cylinder engine. Engine and Drivetrain: 2.4-liter inline four-cylinder engine, 169 horsepower, 160 lb-ft of torque; 2.4-liter hybrid inline four-cylinder engine, 164 horsepower, 159 lb-ft of torque; 3.6-liter V-6 engine, 252 horsepower, 251 lb-ft of torque; 4-speed automatic, 6-speed automatic transmission; front-wheel drive.